Painter, sculptor and installation artist Aimé Mpane (Congolese, b. 1968) creates colorful, rough-hewn portraits and mosaic-like wall murals from plywood. Constructed of three compressed layers, the light brown, white and dark brown wood represents human skin, which he carves with a traditional African adze. Mpane’s work embodies the pain and grace of human dignity through portraits of people from his homeland who have suffered and endured the effects of colonialism. He was born in the Democratic Republic of Congo, which suffered under the Belgian Colony established in the 19th century by King Leopold II and through the ravages of war and economic blunders in the postcolonial period. Mpane’s work expresses a deep understanding of aesthetic and cultural character of Africa that balances history with contemporary reality. Aimé Mpane presents works from the last five years, which includes several different series. The multi-panel work Regard (Homme, Femme et Enfant), 2014 is a collection of men, women, and children, each depicted on individual panels but presented as a collection to convey the sense of individual, family, and community. 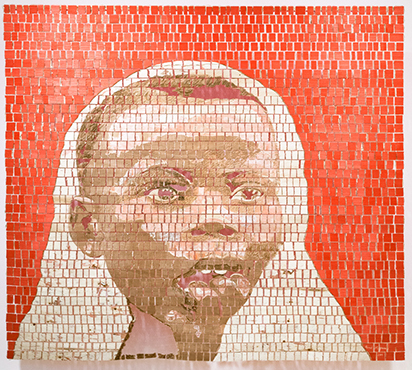 In the Kinoct series, themes of race and modern Congolese identity are explored through portraits of women or children he sees on the streets of Kinasha. 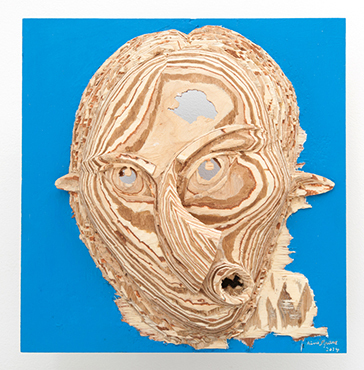 In the series La Demoiselle Pende / Masque Bi-face, Mpane transforms the portrait into “masks” by assembling layers of plywood, the back of each painted a different color, from which a face is carved. The inspiration, in part, is the work of the 20th century Modernist artist, Pablo Picasso, whose imagery was influenced by African masks.